In many places within the Extremadura horses are still used for the daily work with the cattle. Therefore, agile and speedy horses of medium height are preferred. As the pure-bred Spanish horse (PRE) does not really meet this requirements - especially as far as speed is concerned- English Thoroughbred, Arabians and Quarter Horses have been used in breeding for quite some time, in order to produce more agile horses with reduced knee action. In the meantime special stud books have been established for the crossbreeds with Arabians (Hispano Arabians) and Anglo-Arabians (Hispano-Anglo-Arabians). Prices for such "pure-bred crossbreeds" are the same as the prices for pure-bred Spanish horses (PRE). 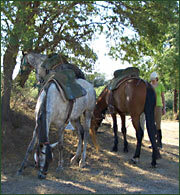 The riding style in the countryside is called "Doma Vaquera" which has been used for generations. As the horses are used for guarding, driving and seperating of more or less wild cattle, absolute obedience, agility and speed are the essential attributes. The methods of training a horse to acquire these attributes are not always completely gentle; however, one should keep in mind what purpose the horses will be used for. Anybody has once be attacked by a wild bull and was lucky enough to ride a well-trained horse, knows what this means. This does in no way mean that we are supporting rough methods, but we think that one should always look at both sides of the story. Apart from that, horse owners in Spain are no different from the ones anywhere else in the world: few want to invest several years (which would be necessary) into the training of their horses. We at Finca La Herradura also prefer these types of horses. They have proved to be extremely robust, tough and persistent, even during long and hard tours. Apart from that they are extremely sure-footed, even in the most difficult terrain. When treated in a easonable way, these horses are friendly and become closely attached to their riders. There are always around 30 horses living with us, staying together as a herd in an outside open barn all year round. 21 are our own horses, some of them bred by ourselves, the rest belong to our clients who bring theire horses to us to start them under saddle. I would say that our method of starting a horse under saddle is close to the English style of riding. However, the young horses are trained on 4 reins for a relatively long period of time (at least 3 months). This is done to treat their mouths with special care. In the beginning, the reins of the bridle are used with very little contact to the bit while the reins of the caveson are almost exclusively used. When the horses are getting to find their balance, the bridle reins are used to an increasing degree. This method will produce a sensitive horse reacting to the slightest instruction from the rider. As we are often taking our horses for long-distance rides, partly in challenging terrain, we only use high-quality equipment. We prefer to use the "Portuguesa Mixta", a saddle which is manufactured from first-class leather and has a large contact surface. It has ridges at the front and back offering extremely good support to the rider. We use the traditional Vaquero bridle - which is very robust, but without any unnecessary straps or buckles - in combination with the "Mosquero" (fringes over the forehead of the horse to keep away the flies), which is extremely important during the summertime. We do not use a bit, we are riding with Hackemore. This is, in our opinion, the best tack for long-distance rides. 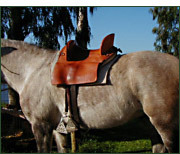 The riding style can be described as similar to Vaquero style riding. The reins are held in one hand and the horses react on neck reining in combination with a light rider leg. 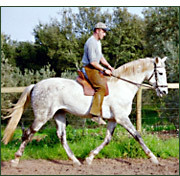 However, the horses can also be contolled easily and react properly to "normal" positioning of the reins in two hands. When riding at walking pace, we hold the reins in loose contact so that we do not disturb the horses´ hind quarters in taking up the weight. Rising trot is done with slightly tightened reins and just a slight squeeze with the leg will cause your horse to gallop. Galloping ist done at a quiet pace with the reins being taken up and in light seat.